The Agency Board of Directors voted Wednesday, August 15, 2018 to approve financing incentives for Pike Development in the City of Binghamton. The measure was approved by a vote of 7-0. Pike Development will build an approximately 24,000 square foot mixed-use building located at 7 Hawley Street in downtown Binghamton. The building is part of a larger redevelopment project for the site that also includes a municipal parking garage in partnership with the City of Binghamton and New York State Economic Development. The City applied for and was awarded $3.45 million through an Empire State Development grant which helps make the project possible. The proposed design makes use of the curved nature of the site by locating the retail and residential use along this unique boundary. The glass-fronted retail will have high visibility and residents will have views towards this prominent corner. A curved brick exterior ties the facade into the surrounding buildings downtown. The building will have 18 market rate apartments and up to 6,000 square feet of retail space. The estimated project cost for the mixed-use building is approximately $4.5 million. The estimated project cost for the parking garage is $10.5 million. Bringing the total project cost and investment in Downtown Binghamton to $15 million. Pike Development has experience in parking garage developments across New York State, including a five-story facility at SUNY Upstate Medical University and a $12 million facility on Cornell University's campus. 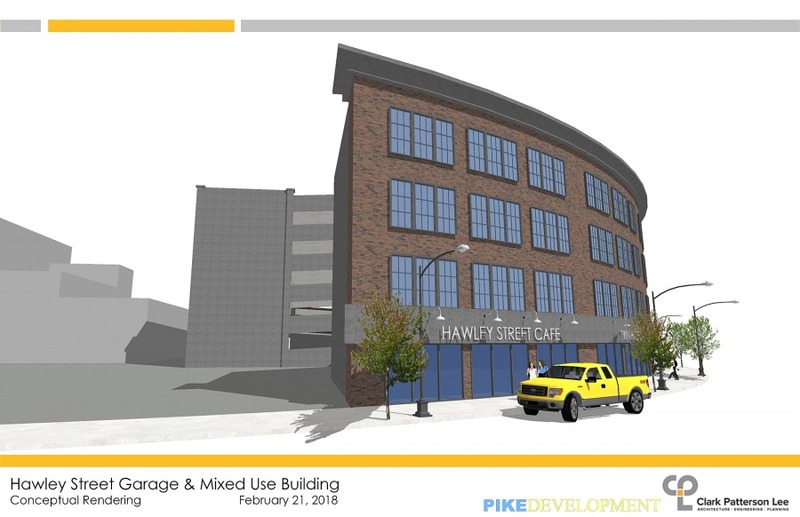 Groundbreaking for full construction of the 7 Hawley Street project is expected within the next couple of months. Tentative opening for the new public parking garage is Spring 2019.